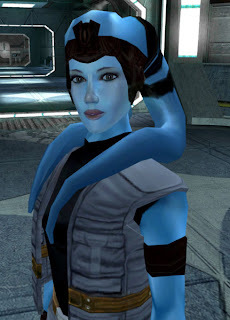 Fridays Star Wars the old republic ( back in 2010) update gave us an insight to the first companion - the Twi'lek Vette. Therefor we will continue our Species of Starwars column with an inside to this colorful species. Twi'leks (pronounced /'twilɛk/) were an omnivorous humanoid species originating from the planet Ryloth. They tended to eat cultivated molds, fungi, and rycrit meat. Their distinctive features included colorful skin, which varied in pigment from individual to individual, and a pair of shapely prehensile tentacles that grew from the base of their skulls. The tentacles, called "brain-tails," "lekku," "tchun-tchin," or "head-tails" are advanced organs used for communication and cognitive functions. Twi'leks possessed a fairly standard humanoid vocal structure and were capable of learning most alien languages; however, they usually preferred their native language of Ryl, which incorporated subtle movement of the lekku. When they wished, they could even communicate in complete secrecy using their versatile brain-tails. 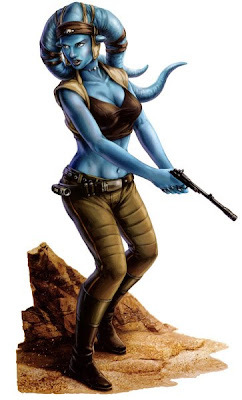 Twi'lek females were often used as slaves or dancers because of their beauty. The two most striking features of a Twi'lek were their broad range of skin coloration within the species, and pair of brain-tails. The brain tails, also called "tchun-tchin" or "lekku", protruded down the back of the skull and contained part of a Twi'lek's brain. The very word "Twi'lek" is believed to be derived from semi-Basic "twin lekku." A Twi'lek's brain-tails served many purposes in their daily lives and culture, storing fat and being used as erogenous zones. The Twi'lek's native language of Ryl was spoken using a combination of words and subtle movements of the lekku. Newborn Twi'leks had no lekku, as they presumably grow out during childhood. A Twi'lek's brain-tails were highly sensitive, and grabbing them forcefully was so painful that it could easily incapacitate almost any Twi'lek. Sometimes, damage to the brain-tails caused lasting damage to the Twi'lek's brain. They could be replaced by cybernetics, however, as in the case of Rianna Saren. heir brain-tails were a source of great pride to Twi'leks, especially when confronted by other species. The name "tchun-tchin" actually referred to each lekku—'"tchun" being the left lekku and "tchin" the right. In casual conversation the Twi'leks would usually refer to their lekku as "tchun" or "tchin." The range of possible Twi'lek skin colors was extremely diverse, including green, orange, brown, yellow, blue, gray, pink, black, white, red, and purple, all in varying shades and hues. 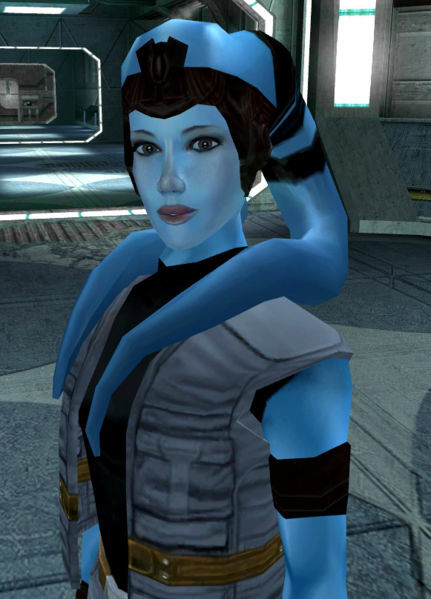 Other types of Twi'leks included the particularly rare turquoise-skinned Twi'leks, known as Rutian Twi'leks, and the rarest red pigment of the Lethan Twi'leks, whose skin color was caused by a mutation of the genetic code. Some Twi'leks took to dyeing their skin to produce a pattern, as did the dancer Ayy Vida. Males had humanoid ears, and among females there is equal biological evidence for humanoid ears and ear "cones". While some headdresses were cultural decoration to denote status, quite a few were originally introduced as "muzzles" to prevent the slaves from having access to a language that non-Twi'lek handlers could not understand. Female Twi'leks have been considered especially attractive and slender, which made them favorite subjects for slavery and entertainment. The beauty of female Twi'leks was well known throughout the galaxy, and as a result many young Twi'leks were sold into slavery, becoming dancers or status symbols, most notably by Jabba Desilijic Tiure. The usual ugliness of the males was also well known. The natural grace and exotic beauty of the female Twi'leks made them a popular target among slave traders. Many Twi'leks actually encouraged the slave market on their own planet. Some saw it as a chance to make money by kidnapping or selling orphaned children, while others saw slavery as a way of saving children from growing up in Ryloth's harsh environment. A number of Twi'leks believed that slavery was an efficient way to proliferate their species and preserve their culture, as the Twi'leks lacked their own means of inter-planetary travel. Regardless of how it came about, many Twi'leks lived as slaves or entertainers and were considered status symbols, especially the females of rarer skin hues: the Rutian and Lethan Twi'leks. 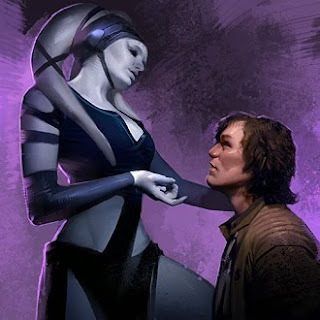 Twi'leks that managed to escape from captivity usually turned to a life of thievery, with both genders making use of their powers of seduction. While many Twi'leks lived their lives as merchants or even criminals, the race also had a proud and honorable warrior tradition. It was Twi'lek warriors who invented the Chir'daki, or Deathseed, starfighters that married the TIE Fighter cockpit to the S-foils of the X-wing starfighter as well as using a rotation system similar to what allowed the B-wing starfighter. During the Bacta War, Twi'lek warriors assisted Wedge Antilles in the fight against Ysanne Isard. The clothing of Twi'leks depended on their gender. While most male Twi'leks wore long, loose robes, female Twi'leks typically wore tighter, more revealing clothing to maintain their elegant figures and enhance their value to males. Twi'lek dance costumes were typically made up of silky veils that clung to their bodies, although other kinds were used, such as a revealing net costume Oola once wore. When meeting a stranger or guest for the first time Twi'leks will usually exchange gifts or something else as a welcome. When welcoming a large number of beings they will usually throw a party and use their traditional dances as entertainment. It is as Cham Syndulla once said, "it is customary to share what we do have." Twi'leks when on Ryloth live in simple mud brick dwellings that protect them for the scorching heat of their homeworld. They often decorate them with native textiles and simple things. When in a city Twi'leks use more galactic standard dwellings with technology though they are still modified to survive Ryloth's environment. Twi'lek society was divided into clans, with each clan having its own city. Each city had its own government, which was led by a five-member head-clan. These five Twi'leks would lead the society in all matters until one member of the head-clan died. At that point, the remaining members of the head-clan would be cast out into the barren landscape on the day-side of the planet, presumably to die, thus allowing the next generation to take over. If the next generation was not yet ready to claim their inherited positions, then a set of regents would be selected to rule until the proper time.